Here we are in the first six months of 2011 and the efforts of the dedicated crews of Mel Fishers Treasures have produced some amazing finds and perhaps the first tantalizing clues to even bigger finds to come. In March of 2011 at the northern end of the Atocha site, Capt. Andy Matroci and his crew on the J.B. Magruder found a cluster of treasure that was extremely unique. 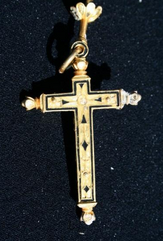 First and foremost was a gold rosary with a cross inlayed with wood and enameled. 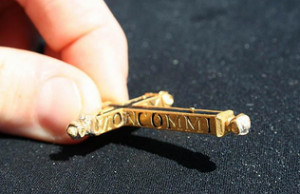 The cross was inscribed with a Latin based motto that has been a bit of a challenge to decipher. When the Spanish came to the New World to explore, conquer and exploit for the King, for the church, and for themselves, they brought little in the way of personal possessions. They could not read, most could not write and had to – by force – travel lightly, what they could carry with them were the comforts of their Church and religion. The parables and stories of the Saints lives they had heard since childhood would have offered a comfort that cannot be downplayed. This was perhaps the most important possession a Spaniard carried with them into the New World – the strength of their religious beliefs. Most conquistadores, colonists and converted indigenous peoples would have carried some talismans of their faith, crosses, rosaries, medallions and small lockets containing either religious imagery or articles directly associated with a favorite saint. As can be seen, the front of the cross is inset with wood. Such crosses were not uncommon during this time period, in fact some of the wood used in such crosses were thought to be wood from the “true cross”, or the original cross that Jesus Christ was martyred upon. During the Middle Ages and beyond, there was a sort of cottage industry that cropped up around relics of religious icons – especially those thought to belong to the story of Christ itself. Whether or not the current example was one of those is impossible to say. The wooden upright and the crosspiece of the cross all have small gold ornaments representing the three nails used to crucify Christ. The reverse of the cross shows geometric designs along both the upright and the crosspieces that bear traces of enameling. The real intriguing aspect of the cross comes when viewed from the sides, around the side is an inscription in Latin which reads running from the left top of upright along the left crosspiece around to the right had side and returning to the top, (X OS NON COMMI NVETIS EXOS X). Much speculation and research has gone into this with no firm answers; however the best translation we have now is “NOT A BONE OF HIM SHALL BE BROKEN.” This is from the New Testament of the Holy Bible (John 19:36) and is one of the signs from earlier scripture that were fulfilled and proved that Jesus was the prophesized messiah. The Cross is attached to the chain of a rosary, the beads of which are absent with a single existing ebony example. Many religions use prayer beads as an aid to prayer. These beads help focus the mind to meditate on the divine presence, while the almost subconscious pattern of repetition on the beads keeps one from external distraction. The Holy Rosary as used in Catholicism, is closely associated with Saint Dominic de Guzmán (1170-1221 A.D.), the Spaniard who founded the Order of Preachers, better known as the Dominicans. From the fifteenth century forward the Dominicans were the foremost promoters of the Rosary. Recent scholarship suggests, however, that the first groups to combine the repetition of the Hail Mary with the contemplation of Mysteries were other religious orders in Prussia around 1300 A.D.
Over the next 250 years the devotion spread across Europe, reaching the laity via voluntary confraternities and rosary picture-books. There were numerous competing versions, advocating as few as five Mysteries and as many as 200. The matter was not settled until 1569. In that year St. Pope Pius V, himself a Dominican, issued an apostolic letter establishing the fifteen-Mystery form of the Holy Rosary as the official, Church-authorized version. This was the format in use for the next four centuries. In the year 2002, Pope John Paul II published an apostolic letter that added five more Mysteries, making a total of twenty authorized Mysteries. The Church celebrates the feast of Our Lady of the Rosary on October 7. This commemorates the day in 1571 when Christian forces defeated the Turkish (Moslem) fleet in a sea battle at Lepanto, off the western coast of Greece. St. Pope Pius V had asked all Christians to pray the Rosary for victory. Recall the first Rosary Mystery and recite the Our Father on the next large bead. The Joyful Mysteries are meditated on Monday and Saturday, Sundays of Advent and after Epiphany until Lent. The Sorrowful Mysteries are meditated on Tuesday and Friday, and Sundays in Lent. The Glorious Mysteries are meditated on Wednesday and Sunday. The Luminous Mysteries are meditated on Thursday. On each of the adjacent ten small beads (also referred to as a decade) recite a Hail Mary while reflecting on the mystery. Each succeeding decade is prayed in a similar manner by recalling the appropriate mystery, reciting the Our Father, ten Hail Mary’s, the Glory Be to the Father, and the Fatima decade prayer (optional) while reflecting on the mystery. When the fifth mystery is completed, the Rosary is customarily concluded with the Hail, Holy Queen. It is most unfortunate that the wooden beads that were part of this rosary are now gone, however such is the nature of the sea: man-made objects do not survive well in the ocean environment. However there is attached to the chain a religious medallion with interesting inscriptions. 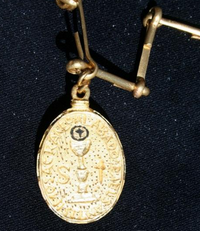 On this lovely Gold Medallion are religious messages that appear on both sides one shows the Holy Eucharist (the Host) surmounting the chalice (holy grail). Both of which are used in the communion ritual of Catholicism wherein the partaking of the bread (the wafer/Eucharist/ Host) and the drinking of the wine from the grail are “transubstantiated” to the blood and the body of Christ. Around the center symbol are the words in Spanish (ALABADO SEA EL SANTISIMO SACRAMENTO) Or “Praise the Blessed Sacrament”. 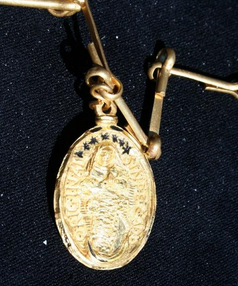 This follows the depiction on the opposite side of the medallion which is the “Virgin of Guadalupe.” While some of the writing is obscured we can assume that it follows other objects with similar imagery closely. In this case the writing is in Spanish and reads (SIN PECADO ORIGINAL) or “Without Original Sin”. At this juncture within the Catholic Church there was a movement to recognize Mary the Mother of God as having been born without original sin (it is believed by Catholics that this sin was accrued by Eve in the Garden of Eden and handed down to all humans). The Marian movement was gaining credence throughout the Catholic World but it was still a contested issue. This medallion shows that the owner believed and supported this doctrine. 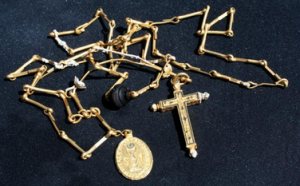 The Rosary and the Cross represents a wonderful connection to the religion of one of the important people aboard the Nuestra Senora de Atocha, it is indeed a spectacular object. The Author would like to thank Ms. Connie Schniedman for the fantastic time and effort she contributed to our research without the good work of folks like Connie we would indeed be poorer in our understanding.